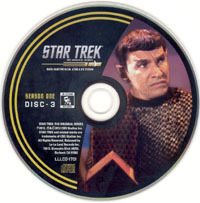 While many albums of music from Star Trek: The Original Series (TOS) have appeared on the market, only a handful of those were of the actual original recordings used in the TV program itself. 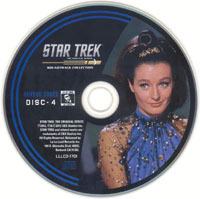 Additionally, they typically gave you only about 2/3 of the music from whichever episode they focused on, and often had some bizarre labelling irregularities. 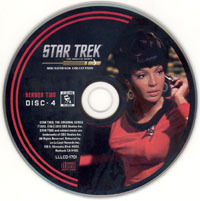 However, in 2012 we got the most definitive Star Trek album yet - a 15-disc set claiming to have every last note of Star Trek music from the 3-year 1960's series. Oh yes. I, for one, was so ready for this, I snapped it up in a heartbeat. All Tracks by Alexander Courage. Disc 2, Track 17: Itchy Hand (originally from "The Naked Time"). "Itchy Hand" really only works in "The Menagerie". 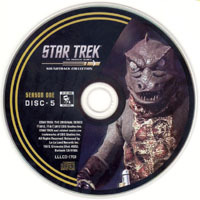 One point of labeling confusion concerns the track "Monster Illusion". While this appears to be on the older CD album for "The Cage", that album is clearly missing the lengthy cue that comes just before - a particularly beautiful one which I had been seeking to reconstruct for many years. Well, the 15 CD box set contains no less than three versions of that missing cue (one for each season), each time merging it with the cue that came afterwards and labeling the pair of them simply "Monster Illusion". I have split the listing into two parts, to differentiate the half that appeared on the older album from the half that did not. The subtitles "Rigel 7" and "The Kaylar" are my own additions, obviously derived from the action of the episode. Also, evidence indicates there is no cue called "Hot Sun". They probably meant "Hot Skin", and didn't realize they had included it at the end of track 16 instead of the beginning of 17. 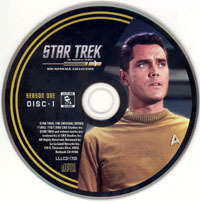 Tracks 2-8 contain music from "Shore Leave" by Gerald Fried. 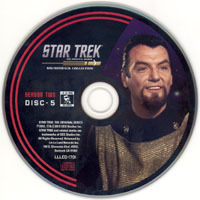 See TOS soundtrack collection disc 4 below for comparison details. All Tracks by Fred Steiner, except as noted. 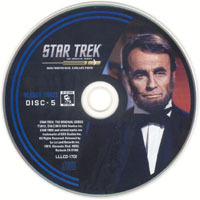 Note that this older CD typically took liberties with placing cues out of chronological order, and mislabeling many of them. The letters (a), (b), (c), etc. here indicate the order in which they feature within each track. 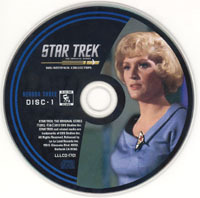 "Bride of Chaotica" (Voyager season 5). When this first came out, the highlights were the Fred Steiner tracks from the original series, now surpassed by the more complete presentation on the 15 CD box set to the left. However, these versions do seem brighter than their counterparts on the 15 CD box set, and for cues like "Fesarious Approaches", I think I might just prefer this presentation anyway. 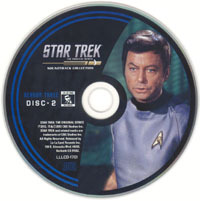 The Best of Trek Vol. 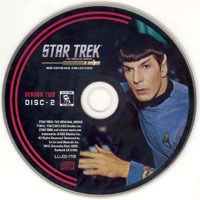 2.
under disc two of the TOS soundtrack collection. the music from these episodes. + Library Tracks & Misc. 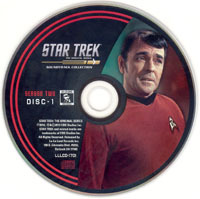 There are a lot of wildly different listings all over the internet regarding exactly what is contained in track 2 of this disc, and of course they can't all be correct. I count ten separate cues in all, and some attempts to list them all simply run out of space! 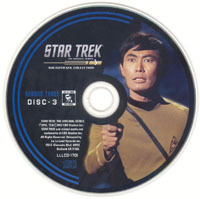 Unlike the 15-CD box set which put the cues in chronological order, the 30th Anniversary Best of Star Trek Volume 1 disc jumbled up the order of the cues considerably. 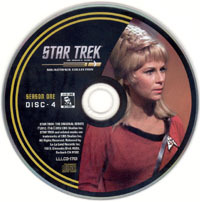 Careful comparison with both the rendition on the 15-CD box set and the actual episode itself have allowed me to arrive at the listings above, splitting each track back into its individual cues. 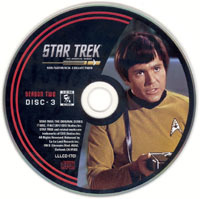 Track 2 therefore begins with (2a) Bartender Bit, then (2b) They Quibble Over Quibble (a mislabeling of "They Quibble Over Tribble"), and so on until finishing with (2j) Raining Tribbles. "Heroes and Demons" (Voyager season 1). + Library Tracks and alternates. 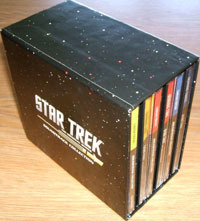 This box set really is one-stop shopping for those of us that love the bold brash music of TOS: The Original Series. "Every note of it" has indeed been "lovingly remastered from the first generation quarter-inch monaural library tapes", including a collection of classic sound effects created by the orchestra. 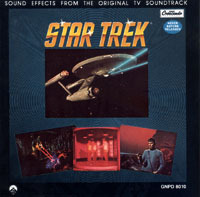 In addition to the original soundtrack recordings, there are many examples of re-recorded music from Star Trek, most of which I will not get into here. However, one album I remember especially fondly. After having bought it for "The Enemy Within", I wound up being quite enchanted and haunted by Jerry Fielding's beautiful score for "Spectre of the Gun". Article written by Martin Izsak. Comments on this article are welcome. 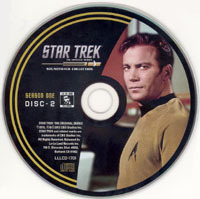 and our catalogue of Star Trek music. Doctor Who 50th Anniversary 11-disc Music Collection.